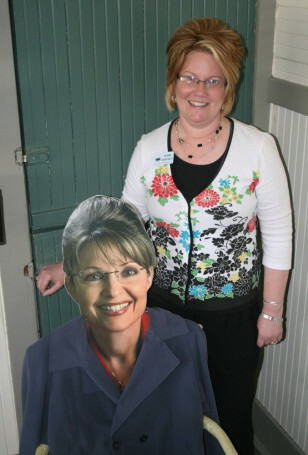 Lyn Carden, right, executive director of the Greater Wasilla Chamber of Commerce, stands behind a cutout of former Alaska Gov. Sarah Palin in in Wasilla, Alaska. The chamber keeps the cutout in the chamber office so tourists can have their picture taken with it.